The zodiac sign of a person born on this day is Aries ♈ (The Ram) – a cardinal sign with Fire as element. March 22 is the 81st day of 2019 and there are 284 days remaining until the end of the year. Friday is the day of the week. This is the 12th Friday this year. Famous Mar 22 birthday celebrants include Chris Wallace, Linden Chiles, May Britt, Francesco Quinn, Jeremy Clyde, Shannon Bex, Wilfrid Brambell, Kellie Shanygne Williams. 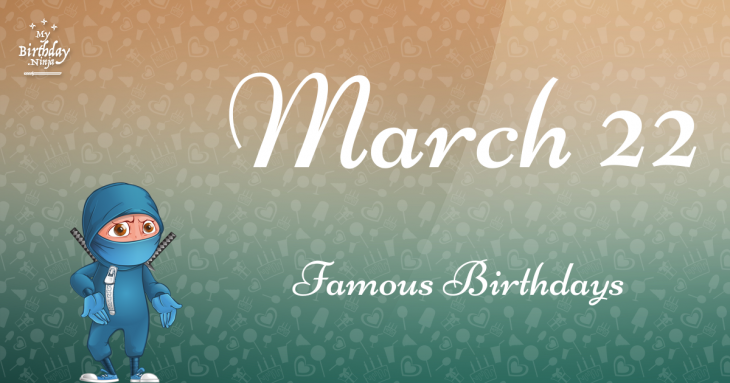 The following famous people celebrate their birthday on March 22nd. The list is arranged in chronological order and includes celebrities like actors, actresses, models, singers, rappers and producers. Click the after the name to explore the birth date info and know the meaning of their life path number. The epic list contains 247 persons. Showing 1 - 30.